The Energy Efficiency Design Index (EEDI) established a baseline for CO2 emissions from vessels in terms of grams of CO2 per tonne (of cargo) per nautical mile. The EEDI is being phased in gradually. By the time Phase 3 kicks in from 2025 onwards, the requirement is a reduction of 30% against baseline. So now the shipping industry has emission reduction targets, how will it achieve them? Can this, as the main marine engine builders suggest, be achieved with the advances made in new engine, turbocharger and propeller designs? Are coating suppliers also able to contribute? Do we simply switch fuel? Most of the two-stroke engines now being installed are long stroke engines with a higher power to weight ratio, which increases propulsion efficiency. To improve the efficiency of an engine manufacturers will seek to improve the ratio of the maximum pressure i.e. the firing pressure and the mean effective pressure. The greater the ratiom, the higher the engine efficiency is and the lower the Specific Fuel Oil Consumption (SFOC). In all types of engine there are efficiency gains to be made mechanically. By improving the lubrication and the materials of all engine parts subjected to friction further improvements in the overall efficiency of the engine can be made. The predominant area for frictional losses is the piston ring package. Therefore, manufacturers have put a great deal of effort into reducing this loss. Bearings are another source of friction and again material and lubrication improvements contribute to a reduction in losses and therefore improved efficiency. Another way that has been proven to improve efficiency is the switch from mechanical control of engines using camshafts to electronic control. Electronic controllers can monitor and adjust for more parameters during the operation of the engine. Electronically controlled turbocharging also has a part to play in improving a ships overall efficiency. By having a system that adjusts to the operating condition of the engine manufacturers have been able to reduce the SFOC by up to 3%. “The only hull coating to combine the low surface friction of silicone with efficient fouling preventing biocides in a single coat, Hempaguard achieves outstanding resistance to fouling, even during idle periods of up to 120 days. Hempaguard goes one step further in delivering efficient operations as it retains its effectiveness when switching between slow and normal steaming offering unrivalled flexibility in fleet utilisation. “Hempel also recently launched a new antifouling coating range, the Globic 9500 series. These are two premium antifouling coatings – Globic 9500M and Globic 9500S – which offer customers a potential 2.5 percent reduction in speed loss, equating to significant fuel savings and lower CO2 emissions. This significantly improves the operational efficiency of a vessel and minimises the operator’s environmental footprint. “This new range of antifoulings have been specifically designed for new buildings and dry-dockings. Globic 9500M (M for maintenance) protects against slime as well as soft and hard fouling. Globic 9500S (S for static) protects against hard fouling even during extended outfitting periods. “Together these two coatings deliver unparalleled protection and are the next step in high performing antifouling protection offering customers improved operational efficiency, flexibility and a high return on investment. A great deal has been made about Liquefied Natural Gas (LNG) being the panacea for ships’ fuel. However, the fact that LNG is predominantly methane which is a greenhouse gas (GHG) 28 times more potent than CO2 is usually ignored. Methane slip through the entire supply chain not to mention through the engine has the potential to negate any benefits LNG may offer. There are better alternative fuels such as methanol which do not have the hazards associated with LNG. So, as a very simplistic analysis the possible accumulated gains are 23-29% improved efficiency before we consider a switch of fuel. 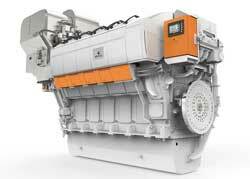 Both MAN Diesel & Turbo and Wärtsilä Marine Solutions are continuing to develop engines with greater efficiency. By combining these engines with other technologies, such as waste heat recovery to generate electricity, and advanced coating technology, the future emissions targets appear achievable.